Not, as you may suspect, the words of John Shuttleworth but rather those of Barry Manilow – serving to demonstrate exactly how NOT to write a song about the mysteries of The Bermuda Triangle, the perplexing area of the North Atlantic Ocean between Bermuda, Florida and Puerto Rico in which many aeroplanes and boats are said to have vanished into thin air. A most perplexing mystery indeed. Canadian band High Watt Electrocutions, however, know EXACTLY how to write a song about an unexplained and seemingly unquantifiable phenomenon…….they made it an instrumental. 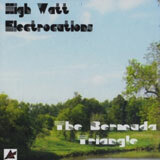 The evil genius behind High Watt Electrocutions, Ryan Settee, advises that ‘…this is, after all, the audio equivalent of the fabled area of the same name…’ and having listened to the single serpentine, 39-and-a-biscuit minute track that makes up ‘The Bermuda Triangle’, I am not inclined to quibble. Y’see, in their more usual guise, High Watt Electrocutions are a fuzz-drenched stoner-psych-rock whirlwind – think Nebula with a hint of Chrome – and for ‘The Bermuda Triangle’ they have chosen to, in their words, ‘…tone down the fuzz guitars and menacing presence…’. The main body of the track takes the form of a more-or-less straightforward musical journey, or narrative if you will, that would appear to chart a journey from calm, tranquil, balmy waters, into the weirdness that exists at the heart of the Bermuda Triangle itself and then….well…to who KNOWS where. As the journey progresses, so the musical palette changes – for the first leg of the journey, guitars are shimmering, bright and liquid, they chime and drone pleasantly in layer upon layer. A bass-led melody takes the fore and guides us through a summery forest of organs that emerges into a relaxed section of strummed acoustic guitar that really does evoke the feel of sun on skin. A plangent haze of watery guitar, buzzing organ and distant-sounding drums leads to lysergic backwards-masking and a mournful, minimalist solo, that in turn becomes kaleidoscopic and acid-fried, sounding for all the world like the sucking vortex of energy that functions as the gateway to another dimension, hiding at the heart of the Bermuda Triangle. From then on out, EVERYTHING becomes hazy, touched with sadness and cinematically grand in scale. An acidic guitar solo brings the track to a conclusion, leaving only the hissing of rain and the sound of a storm rolling in. All terribly effective and stunningly realised, BUT, perhaps a little menace would have been a good idea? I mean, I don’t know about YOU, but if I was adrift or tumbling helplessly from the sky, my readouts and instruments useless, in the Bermuda Triangle I would most DEFINITELY be feeling menaced, to say the LEAST! Beautifully put together it may be, but the edge of menace is most definitely lacking within this narrative. Even the touch of the cosmic found in the warping and phasing sounds in the latter part of the track are not touched by the terrible. THIS mysterious nexus is just too darned cheery by far. Ultimately, though, it mattereth naught, as the standard of playing is superb and the music is more than listenable. I wouldn’t, however, recommend taking it on holiday with you. Why tempt fate?